Fortune's Formula is a fascinating study of the connections between such seemingly unrelated topics as gambling, information theory, stock investing, and applied mathematics. The story involves the stunning brainpower of men such as MIT professor Claude Shannon, who single-handedly invented information theory, the science behind the Internet and all digital media; Ed Thorpe; and John Kelly of Bell Laboratories, who developed the "Kelly criterion," a now-legendary investment strategy for maximizing growth while controlling risk. Initially, Shannon and Thorpe took Kelly's theory to Las Vegas and applied it to roulette and blackjack. Later, they took it to Wall Street and cleaned up--Shannon made a personal fortune while Thorpe created the highly successful hedge firm Princeton-Newport Partners. They both discovered that Kelly's system was particularly effective when applied to arbitrage (minute price differences that result from market inefficiencies). As Poundstone ably demonstrates, the merits of Kelly's criterion are still hotly debated today. "In 1956 two Bell Labs scientists discovered the scientific formula for getting rich. One was mathematician Claude Shannon, neurotic father of our digital age, whose genius is ranked with Einstein's. The other was John L. Kelly, Jr., a Texas-born, gun-toting physicist. Together they applied the science of information theory -- the basis of computers and the Internet -- to the problem of making as much money as possible, as fast as possible. Shannon and MIT mathematician Edward O. Thorp took the "Kelly formula" to the roulette and blackjack tables of Las Vegas. It worked. They realized that there was even more money to be made in the stock market, specifically in the risky trading known as arbitrage. Thorp used the Kelly system with his phenomenonally successful hedge fund Princeton-Newport Partners. Shannon became a successful investor, too, topping even Warren Buffett's rate of return and using his wealth to drop out of the scientific world. Fortune's Formula traces how the Kelly formula sparked controversy even as it made fortunes at racetracks, casinos, and trading desks. It reveals the dark side of this alluring scheme, which is founded on exploiting an insider's edge. The cast of character spans J. Edgar Hoover, Rudolph Giuliani, Michael Milken and Warren Buffett; Hollywood producers, Wall Street crooks, snarky Nobel Laureates, and the Jewish mob. Fortune's Formula explores a new and surprising side to the Shannon legacy. Based in part on Shannon's previously unseen personal records as well as interviews with both of Shannon's wives, Thorp, and many others, it is the first full-length treatment of a subject that is changing ideas about finance. Claude Shannon believed it was possible for a smart investor to beat the market - and Fortune's Formula will convince you he was right." The combination of William Poundstone covering Edward Thorpe is irresistible, and this work merits five stars alone simply for the gravitational attraction of two such luminaries in orbit with each other. But this is an excellent work deserving of five stars, as are all Poundstone's books (I have Poundstone and his "Prisoner's Dilemma" to thank for awakening in me the possibility of game theory applied to Finance). Poundstone is one of those rare authors, like John Derbyshire, author of "Prime Obsession," who is gifted in two cognitive hemispheres: both left brain and right brain. His prose is deft, clear, and engaging. But his explication of mathematical concepts in prose is his strength, and it is in full force in "Fortune's Formula: The Untold Story of the Scientific Betting System That Beat the Casinos and Wall Street." For anyone who has had to wade through a badly written treatise on a mathematical subject we can only beg Poundstone with the cries of the truly damaged "please write math textbooks!" such is the level of his clarity. But the subject matter of the intersection of mathematics, gambling, information theory, and finance itself is truly compelling: for this is the book that Poundstone was born to write. All the greats are here: Louis Bachelier, Edward Thorpe, Claude Shannon, Robert Merton, Fischer Black and Myron Scholes, and of course John Kelly. Even Michael Milken enters stage left as a boogey man/Fagin, and Thorpe's troubles with Milken only heap more scorn on Milken's deservedly reprehensible reputation. Sadly, an examination of Elwyn Berlekamp is absent from this book, as are several other minor players in the math/fin pioneering days. Just after reading I considered this book one of three must-read non-fiction books for any professional. After a while my emotions have settled down a little bit, but still I would consider this book really outstanding. All of us dream about becoming a billionaire and is impressed by stories of rises and falls in the business world. This book gives a quite detailed and - I hope - close to real insight into a few spectacular successes (and failures) in making money "out of nothing". Even if it is not a guide how to get rich soon, it can help adjust a strategy of any amateur or professional investor. The mob angle also touches blackjack pioneer Ed Thorp. Seeking financial help to test his theories in the real world, Thorp wound up in Reno with two mafia backers at his side. His source of funds was a complete accident, of course; Thorp clarifies he would not have taken `mustache money' had he known its origins. While true that Shannon's Information Theory was based on data transmission (i.e. wires), that the Kelly formula was originally inspired by gambling insights, and that Thorp had an amusing run-in with Soprano types, the wise guy focus seemed tangential. Why so much emphasis and material on Longy Zwillman, Manny Kimmel and their ilk? I suspect the heavy hand of marketing; organized crime skews interesting for Joe Reader in a way that mathematical formulas do not. With their own separate methods, Thorp and Shannon trounced the market averages over a period of decades. The retelling of how they did so exposes another kink in the book's implicit premise: the actual formula in Fortune's Formula is not a money-making recipe, but rather a fatality-avoidance recipe. The Kelly criterion was not truly central to Thorp's or Shannon's financial success; it merely facilitated that success via proper understanding of bet size. Think of it this way: In order to succeed as a trader or investor, you must practice effective money management. But effective money management guarantees nothing on its own. It is a necessary, but not sufficient, condition... ensuring survival is not the same as ensuring profits. Ed Thorp made a pile of money exploiting early market inefficiencies. He also had a knack for finding new inefficiencies when the old ones went away. In other words, Princeton-Newport Partners (Thorp's flagship fund) was a pioneer in statistical arbitrage. Shannon's method was even further removed from the Kelly criterion; his market-beating 28% returns came from a buy and hold portfolio more than 90% weighted towards just three stocks! He was an astute observer of technology and consumer trends, smart enough (and wise enough) to stake and hold long term positions in huge winners like Teledyne and Hewlett Packard. As Poundstone recounts, Claude and Betty Shannon were the type of investors who ate a bucket of Kentucky Fried Chicken before buying stock in it. Shannnon's returns are more an inspiration to concentrated value investors than arcane formula followers. His risk management techniques were apparently limited to taking reasonable losses when an idea didn't work out. For all the criticism in this review, the straightforward explanation of theory is where Fortune's Formula shines. Poundstone does a superb job in distilling the essence of Information Theory and the Kelly criterion. He communicates the gist of both in a way that the non-mathematically inclined can grasp, and successfully highlights the subtle points of controversy and real-world application that make both theories so interesting. Last but not least, the academic crowd, aka "the Random Walk Cosa Nostra," takes the worst of it in Fortune's Formula... and very much deservedly so. Poundstone does not have to intentionally skewer these economic leading lights, for their own words expose them as arrogant, egotistical jerks. For example: Paul Samuelson, the MIT godfather of neo-classical economics, chose to trash the Kelly criterion based on a minor league point of disagreement. He ferociously argued it to be a `fallacy,' though the actual objection voiced was little more than a straw man. This distinguished economic statesman apparently enjoyed belittling his opponents and treating them like simpletons; Samuelson's masterstroke was a flaming critique written entirely in one-syllable words. This book is a concise look at the evolution of formal investment theory, with continual contextual references to its ties to gambling and to organized crime. It also is a hilarious and insightful history of gambling from the Bernoulli's in the 1700s through the hedge fund traders of the late 1990's. The author devotes over 50 pages to notes and the index. This was appreciated since I wanted to look up more about so many of the anecdotes he included. Mr. Poundstone poignantly describes the downfall of high-flying firms such as LTCM, where the investment wizards went from the darlings of Wall Street to the dredges of the investment community in large part because they were so clever; and they started to believe they were infallible. One LTCM road-show presentation was held at the insurance company Conseco in Indianapolis. Andrew Chow, a Conseco derivatives trader, interrupted Scholes. "There aren't that many opportunities," Chow objected. "You can't make that kind of money in Treasury markets." In a 1984 speech, Buffett asked his listeners to imagine that all 215 million Americans pair off and bet a dollar on the outcome of a coin toss. The one who calls the toss incorrectly is eliminated and pays his dollar to the one who was correct. The next day, the winners pair off and play the same game with each other, each now betting $2. Losers are eliminated and that day's winners end up with $4. The game continues with a new toss at doubled stakes each day. After twenty tosses, 215 people will be left in the game. Each will have over a million dollars. The author follows the lives of a few major contributors to investment theory, information theory, and betting theory: Claude Shannon, who invented Information Theory and paved the way for the digital computer age; John Kelly, who developed the formula for gains with no possibility of ruin; and Edward Thorpe, who built upon these findings and beat the roulette wheels, the blackjack tables and the investment fund managers. It's a fast read - only 329 pages before the notes and index. I highly recommend it! Just be sure you know the keywords of the book: It's about the UNTOLD STORY, not FORMULA or SCIENTIFIC. I found it very difficult to comment on this book. I can see different people with different expectations will have very different comments. The name of the book should be accounted for some of the bad comments. The highlight of "Formula" and "Scientific" makes people expecting equations and theories inside. However, you can hardly find any formula, and even there're theories explained, just like most books targeting to all audiences, the explanation and equations are usually not "too accurate". The graphs are pretty good, though. For me, I have a degree in Computer Science, and I have experiences and researches in gambling and investment, so by looking at the content of the book, I knew I was familiar witha t least 1/2 of the content (people and theories). However, I did find it interesting later when things are putting together... For example, if you learned Black-Scholes formula from economics studies, you probably don't know Ed. Thorp has derived essentially the same formula in a different form. Or if you learned Kelly criterion from science or gambling, you'll probably not know the geometric mean version in economics fields, and the difference between them. So, as a conclusion, I'm not quite interested in the storytelling, but I'm quite impressed by the broad researches Poundstone has done. But maybe there're too many to be included in this book, it's hard to put everything together in a smooth way to make it interesting all the way to everyone. a) It's an excellent book for someone who have almost no knowledge (but have experience) in the theories of gambling and investment. This book will be a good eye-opening experience to you. b) It's a good book for putting things together for people who learned some theories from different sources. It's also quite interesting to read how the people in different fields were doing similar things and coming with similar results. c) For the real experts, this book should act as a review of the history, and I still believe there're at least some "untold stories" that even an investment expert will find it interesting. Clearly the main protagonists in "Fortune's Formula" were highly intelligent and head of their time. Card-counting, blackjack, arbitrage (eg. potential acquisitions, warrants, options) were all covered, and some interesting approaches to maximizing return vs. risk were addressed. Nonetheless the book was a trial to read - full of sideline ventures of minimal value, superficial/non-lucid explanations of complex concepts, and likely of little or no value today. (Kelley's optimum "betting level" may have prevented Long-Term Capital Management from going broke, at the cost of FAR lower early returns - however, Poundstone did not explore that possibility). Very interesting to read and very useful to know. The Kelly Criterion applies to all variants of investments (gambling, stock market, horse racing, etc). This book explains the history of the Kelly Criterion and academic misunderstanding of it. Any investor or gambler needs this book! An insightful look under the hood at the factors affecting the money making process. With a lot of very interesting stories, from the mob all the way to Nobel prize winners on Wall Street, it shows the latent traps that can destroy the bankroll of investors, gamblers, and poker players. The Ongoing Epic of the Kelly Criterion for Risk Management. 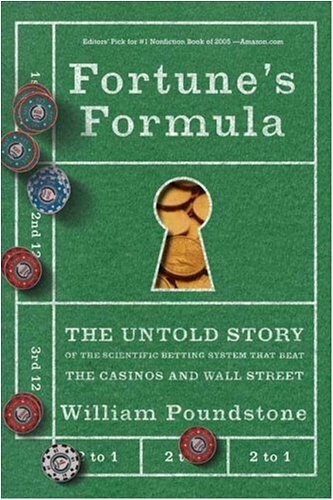 "Fortune's Formula" tells the story of the Kelly Criterion -through the experiments, ideas, wins, and losses of those who have espoused it and who have derided it, at race tracks, black jack tables, sports books, and, finally, on Wall Street. The Kelly Criterion is a risk management formula published in 1956 by Bell Labs information theorist John Kelly, Jr. that dictates how much of your bankroll you should bet based on your edge divided by the odds so that you will have zero risk of ruin no matter how bad your luck is, while increasing wealth faster than any other betting system. It does not address what bets you should make, which is another matter entirely. Instead of writing a simple analysis of the Kelly Criterion, author William Poundstone brings this story alive by relating the histories of key figures who have used, promoted, or criticized the Kelly Criterion: information theorists, economists, traders, gamblers, and gangsters. Some readers may find this approach unfocused and unnecessary. But I think the personalities lend "Fortune's Formula" an epic quality and place the Kelly Criterion firmly in the context of real life, with real consequences, as opposed to the realm of abstruse theories that never leave the halls of academe. The men whom "Fortune's Formula" casts as protagonists are Claude Shannon, the MIT scholar who invented information science and who amassed a small fortune as a buy-and-hold investor, typically making 28% per year on a small portfolio, and Ed Thorpe, author of 1962's gambling classic "Beat the Dealer", 1967's "Beat the Market", co-founder of Princeton-Newport Partners fund (1969-1988) and founder of Ridgeline Partners (1994-2002) quant fund. Ed Thorpe's transformation from MIT egghead to black jack sharp to Wall Street wizard in an ongoing theme, as Thorpe is an immensely successful advocate of the Kelly Criterion -and he is still alive. There is unfortunately little information on John Kelly, because he died in 1965 at the age of 41. The key Kelly challenger is 1970 Nobel Laureate economist Paul Samuelson, who probably overstates his case in calling the Kelly Criterion a "complete swindle" when the point of disagreement seems to be the concept of "utility" in long-tern outcome. Whatever one thinks of Samuelson's outspoken arrogance, he is certainly entertaining. Mobster Manny Kimmel makes an appearance, as do traders Ivan Boesky, Michael Milken, and John Meriwether, as well as numerous information theorists. I read this book mostly for the information on blackjack. Stories about card counters and betting systems fascinate me probably because I can't do it myself. What I got out of it was so much more - the information on investing was like a mastercard commercial - PRICELESS. Using math and statistics to play the market is not new. So if you are looking for new information then this isn't for you. BUT if you are looking for people who actually used their own formulas then this is for you. It is simply awesome. Buffett is even mentioned in here as being someone who uses the Kelly criteria. It's a good read, easy to digest. Made my vacation worthwhile. Having just finished Poundstone's book on Gaming the Vote, I was hoping for a book equally as interesting. Although this book was worth reading, and there are a few aspects from it that I will put into practice, I did not walk away wanting to quote it on a regular basis like I did Gaming the Vote. It gives an interesting historical overview of various scientists involved with gambling and the stock market, and it reviews the concepts involved. These parts were interesting, but truthfully not fascinating. The sections about Murder Inc, Boesky, Millken, and the junk bond collapse were much more interesting.